Buninyong was first settled in 1838. From that time, while some burials took place on local properties, the first ‘official’ burials took place in what is known as the ‘Old Burial Ground’ located on the north side Learmonth Street (West) in the centre of the village. Few records exist about persons buried in this burial ground. With Buninyong’s population reaching some 10,000 people at the height of the local gold rushes of the 1850s and 1860s there were about 100 burials each year – many of them resulting from the unhygienic conditions on the goldfields, women dying in childbirth, rampant childhood diseases and from mining accidents. In the 1870’s the sexton of the cemetery was a Mr Bull, and under his stewardship there was much planting of flower beds, shrubs and trees. Elms and willows were planted alternatively along the banks of the creek and many still survive. The local nurseryman, Francis Moss, and local residents - Messrs Innes, Clark and Biddle - donated many plants to the cemetery. Until the late 1960’s there was an old chapel and office located near the entrance gates. During the 1970s and 1980s the Cemetery became overgrown and neglected, until, in 1991 the Buninyong Shire Council began a restoration program with construction of new roads, reshaping the creek bed, destroying noxious weeds and undertaking a regular mowing program. 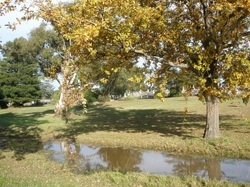 The legacy of this program can be seen today in the beautifully-maintained and historic cemetery, straddling the creek and small lakes, with its mature plantings of deciduous and other trees, its gracious monumental section, and the rolling grassed areas of the newer (1970) lawn section of the cemetery. Persons wishing to use the services and situation of the Buninyong Cemetery must clearly understand that in relation to matters such as plaques and other forms of identification of the deceased, the nature of ornaments or other forms of memorial decoration, or of planting, the Trust’s policies and rules are designed to maintain the cemetery’s sense of history, its general uniformity in its design and memorials, and its overall character and dignity for all those who use or visit the cemetery.